We supply and exportHSI ImpactorinGurgaon, NCR, Delhi , Noida, Ludhiana, Punjab, Uttar Pradesh, Jammu & Kashmir, Rajasthan, Madhya pradesh, Mumbai, Pune, Bhopal, etc and all over the World. 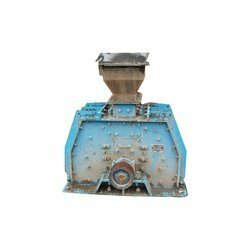 The reversible impactor is one of the most versatile crusher ever designed, used fo crushing various types of materials ranging from friable minerals to hard rocks. They offer high capacities and produce well graded products. They achieve high reduction roll° of around 36:1 or higher. These type of crushers hove few ports to maintain/ replace which are easily changeable. 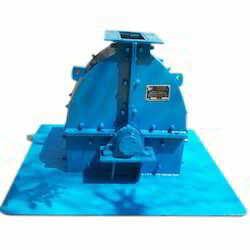 It is used for secondary & tertiary crushing of stone, limestone, minerals, ores, chemicals & fertilizers etc. The frame of the impactor is made out of rolled steel plates with extra support in the from of ribs. Inside the frame are liners which are fixed with CSK bolts and are changed when worn out. This guards the frame from wear & tear. The breaker blocks & hammers are made out of cast aystenitic manganese steel of high grade which is abrasive resistant. The rotor shaft is made out of forged steel for maximum strength. The suspension disc and suspension bars are made out of alloy steel. The paddle hammers swing freely on suspension bars. In case of overload or entry of Tramp iron the hammers retrear thereby allowing the overload or tramp iron to fall through the bottom of the unit thereby preventing any damage to the equipment. The crusher is provided with a screw jack which provides easy manual adjustment of the entire breaker block assembly. When maximum reduction is required the impactor is run at a high speed and for less fines it is run at a lower speed. This impactor is virtually a double crusher in a single frame, breaker block are identical facing each other. Since the crusher operates in either direction, systematic reversal balances the wear & tear on both sides of breaker blocks and both faces of hammers. Hence increasing the life of the crusher & its parts. The design of the impactor is such that the frame can be unlocked in a few minutes, to change the various spores inside the rotor assembly. The impactor is sectionalized so that rotor can be removed without disturbing the feed chute or overhead feeder. The impactor can be daily inspected through the small access doors on both sides. Access doors also provide for removal of suspension bars so that hammer can be changed with the rotor in place.